What follows is a summary of a longer paper on some of the problems that the Cochrane Collaboration face. It is based on the presentation I gave at Evidence Live 2013 entitled ‘Anarchism, Punk and EBM’. But to begin with I want to make it clear that I am fully supportive of systematic reviews and the reasons for doing them. I also want to make it clear that this is not a criticism of the many thousands of volunteers who give their time freely to improve global healthcare. I am in awe of their efforts. My criticism is based on the fact that I feel that the current methods are unsustainable. I have run a number of clinical question answering and between them have answered over 10,000 clinical questions. It is very rare for a single systematic review to answer a question. In an analysis of 358 dermatology questions only three could be answered by a single systematic review, so less than 1%. Although we have only formally analysed dermatology there is little sense that many other areas do noticeably better, but there are some e.g. respiratory (but that would still answer fewer than 5% of the respiratory questions. In answering clinical questions I wish we had more systematic reviews that were useful for my work. Should systematic reviews answer real questions? On average a Cochrane systematic review takes 23 months from protocol to publication  and hundreds if not thousands of hours . This causes problems with both production and subsequent updating of reviews. Clearly, with a finite resource the longer a systematic review takes to produce the fewer you can do. These figures are slightly mis-leading as the number of systematic reviews has increased in that time. In 2009 there were 3,958 active reviews and in 2012 that figure had risen to 4,905. So, in 2009, of the 3,958 reviews, only 1,575 were up to date. In 2012, of the 4,905 reviews, only 1,756 were up to date – an increase in up to date reviews of just 181 in three years. Putting this another way, in 2009 there were 2,383 out of date systematic reviews and in 2012 this had risen to 3,149. 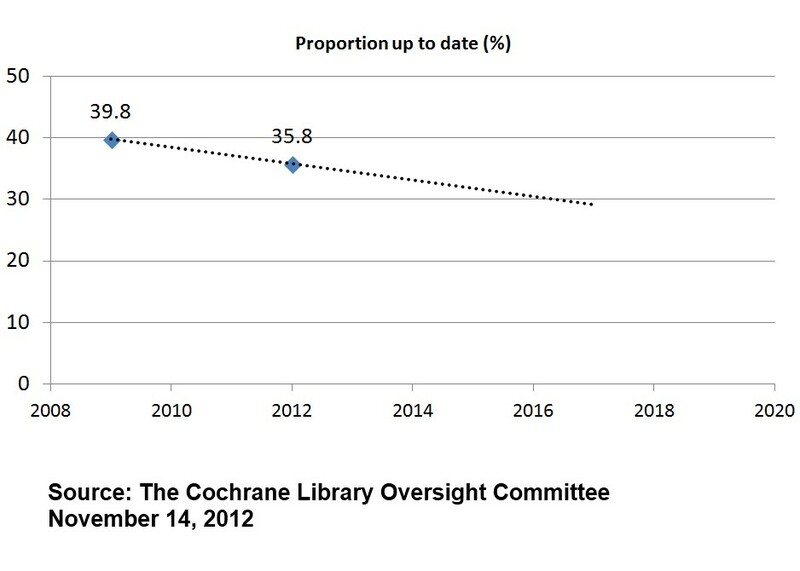 These figures are terrible and are made worse by the relatively recent increase in funding and spending Cochrane has enjoyed . In the last seven years of financial figures the Cochrane Collaboration has spent in excess of £100 million and over the twenty years it has existed this is likely to be over £150 million – over a quarter of a billion US Dollars. It is probably redundant to point out that this is a vast sum. [UPDATE: it has been pointed out that £150 million is actually not that much and could be seen as a pittance – I guess it depends on perspective]. As well as significant financial support Cochrane has the selfless support of 28,000 volunteers. Yet, the number of active systematic reviews is still modest. 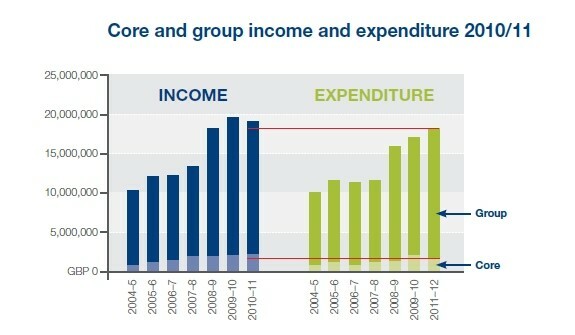 This indicates that the current system is unsustainable and not fit for purpose. The methodology, while reducing some bias, has resulted in a huge cost increase, not just financial but also opportunity cost. Ironically, the case of Tamiflu highlights that the methodology is flawed. This is based on the fact that, when preparing the first Cochrane systematic review on neuraminidase inhibitors for preventing and treating influenza in healthy adults and children Tom and his team only relied on published journal articles . This was subsequently found to miss large amounts of data, most of which was made available for the regulatory agencies e.g. EMA, FDA. The updated, 2012, review  was a huge undertaking, even by Cochrane standards, but it was the only way Tom and his team felt they could obtain accurate estimations of the effect of neuraminidase inhibitors. But Tom is not alone in concerns about methodology, concerns with relying on aggregated trial data were made by Jack Cuzick, at Evidence Live 2013. He made a general call for reviews to be based on individual patient data (IPD). Both Tom and Jack feel that the current Cochrane methodology is not capable of making an accurate assessment of an interventions ‘worth’, albeit for different reasons. The seriousness of this challenge should not be underestimated, it attacks at the very heart of the Cochrane Collaboration. 1) Can we rely on the best trial? A comparison of individual trials and systematic reviews . In this paper the authors (including me) explored a random sample of Cochrane systematic reviews to see how often the largest randomised trial was in agreement with the subsequent meta-analysis. This occurred in 81% of the meta-analyses examined and if the largest RCT was positive and significant it was around 95%. In other words, using the largest RCT can give a broad hint as to the likely result of a subsequent meta-analysis. 2) McMaster Premium LiteratUre Service (PLUS) performed well for identifying new studies for updated Cochrane reviews . In this study the authors compared the performance of McMaster Premium LiteratUre Service (PLUS) and Clinical Queries (CQs) to that of the Cochrane Controlled Trials Register, MEDLINE, and EMBASE for locating studies added during an update of reviews. They concluded that PLUS included less than a quarter of the new studies in Cochrane updates, but most reviews appeared unaffected by the omission of these studies. In other words, you do not necessarily need to get all articles to arrive at an accurate effect size (compared to the Cochrane systematic review). 3) A pragmatic strategy for the review of clinical evidence . In this paper the authors compared a research strategy based on the review of a selected number of core journals, with that derived by an SR in estimating the efficacy of treatments. The authors concluded “We verified in a sample of SRs that the conclusion of a research strategy based on a pre-defined set of general and specialist medical journals is able to replicate almost all the clinical recommendations of a formal SR.”. Essentially, the same message as 2) above. It is a very easy concept, the greater the cost (finance, time etc) of a systematic review the fewer systematic reviews within a fixed budget can be undertaken and kept updated. Therefore, a major focus for Cochrane should be on reducing the cost per review. Cochrane is full of incredibly talented people who appear to focus predominantly on reducing bias and random error. This, to me, is a clear example of the laws of diminishing returns. I would set the major challenge, for the next five years of Cochrane, to be – how to do a systematic review in a month (or less). This side-steps the issue of regulatory data and/or IPD! I see a future for Cochrane as having two types of systematic review: rapid systematic reviews undertaken in a significantly reduced timeframe, and a more costly systematic review that includes regulatory data and/or IPD. If Cochrane can reduce the cost of a systematic review to around 10% of what it is now it means they can do ten times as many. Or Cochrane might choose to do fewer than ten times as many rapid systematic reviews and leave any remaining resource to do the more costly systematic reviews. The issues becomes (i) when can Cochrane ‘get away’ with a low-cost systematic review and (ii) when a high-cost review warranted. These are questions requiring a research base to answer the questions, as well as being a question of values. The argument has been made to me that there is a negative cost of doing a low-cost systematic review that might generate the ‘wrong’ answer. While I appreciate this could be a scenario I would reply that while you’re busy doing one systematic review ‘correctly’ you are neglecting 5-10 rapid systematic reviews that might generate significantly higher benefits. But, the lack of an evidence base is hampering our ability to address these questions. This favours the status quo, which could actually be doing more harm than good. Bottom line: Systematic reviews are vitally important in practicing evidence-based healthcare. Given that there is a finite funding ‘envelope’ it is imperative to maximise the number of systematic reviews that can be undertaken and to maximise relevancy to clinical practice. This means significantly reducing the cost per review and improving the prioritisation process. Allen IE, Olkin I. Estimating time to conduct a meta-analysis from number of citations retrieved. JAMA. 1999 Aug 18;282(7):634-5. Greenhalgh T. Why do we always end up here? Evidence-based medicine’s conceptual cul-de-sacs and some off-road alternative routes. J Prim Health Care. 2012 Jun 1;4(2):92-7.J Prim Health Care. 2012 Jun 1;4(2):92-7. B) because it takes a long time to develop Cochrane review, the methodology that is endorsed is obsolete- we would be better off by doing rapid reviews or consulting individual trials. You cite your paper in which you showed that 81% to 95% times, consulting individual RCT agreed with SR. The problem is, as I wrote to you before, that you CANNOT predict this agreement in advance. It does comes to the tolerance of false-positives vs. false-negative values: how much SRs are we willing to take in order to find out that they agree with a RCT/ individual studies vs. not conducting SR in order to realize that we were wrong? And, when it comes to values, no mathematical solution is possible, I should add. I assume “time” taken for a review is elapsed time. The problem with volunteers is that they fit work in amongst other (necessary, income generating) jobs. This is actually inefficient although it might cost less. 1) Cant really blame systematic reviews for “not answering clinical question”! As the reviews themselves obviously reflect and depend on other evidence out there. And if funders continue to fund rubbish studies that are a waste of time and resources doing that is hardly the fault of Cochrane. Cochrane has done incredible job of raising that very point to the forefront and arguing for change. 2) On the same lines Cochrane has also done great job of pointing out that in many cases we already have the answer we need from the existing RCTs (the Cochrane logo reminds us of that as you know). Strange argument about the 'largest' RCT in many cases is all you need (and not Sys review)………you cant possibly know that beforehand! You have to keep doing a bunch of rcts before finally looking back and saying Oh yes we didn't need to do so many!! 3) The argument about costing too much is interesting – I didn't realize the Cochrane cost that amount of money. Always seemed a bit of a shoestring budget to me. And not sure why the costs are going up. Certainly worth looking at that. I don't think there is a 'quick' way of doing a good systematic review though – it is almost an oxymoron. Have to do it comprehensively or not at all. Plus even if Cochrane costs that much then isnt it a tiny drop in the ocean in terms of costs of all rcts and other clinical studies and a tiny fraction of the entire health care budget? I too am a Cochrane Author and have the corresponding biases. But I quite agree with the author on this. The effort that goes into the review is not worth the output. You have to realize its not just effort of the authors; you have to take into account the effort of the editors, peer reviewers, publishers etc. who work behind the scenes. But, what I would like to say is that it is dangerous when we look at Cochrane Systematic Reviews as the answer to all the clinical questions out there. Increasingly that is whats happening and thats where the problem is. We have to be able to identify when a well done review is required and when a quick and dirty one is enough. I would like to say that we have a lot of lessons to learn from the Open Source/ crowd sourced movements. Take for example Wikipedia, in a way its goals are quite similar to the challenge of The Cochrane Collaboration – to have a organized, critically appraised and updated summary of evidence from RCTs. I feel that the strength of one is the weakness of the other and it is quite possible that we could draw ideas from each other to improve the problems highlighted here. Really good points. I think this is a great example to highlight areas where Cochrane can do better. I worked for a Cochrane group, so please apologize my bias. My main issue is that you have pointed out the benefits of alternative approaches, but I don't think we have looked well in deep on the potential problems of the alternatives. What happen when the results are not correct? When a big trial is big enough? What happen the times the estimate is wrong? Cochrane has built its reputation on its trustworthiness, so reduce the confidence on its estimates may not be the best option for the Cochrane Collaboration. Your main point is that the burden of screening (for searching in different places) could be simplified. Maybe there are other options. Could we use the collective enthusiasm around the world and get teams of 50-60 people doing the screening? Can we learn from initiatives like https://www.zooniverse.org/ to unfold the potential of Cochrane? I really like your analysis of the problems to be addressed: I think the potential solutions still need to be refine a bit more, and specially, be aware of the harms of the different approaches. I found the following of interest as well related to this discussion. Thanks Jon for this critique, very timely! “Although our review was based on a more limited search in databases compared with the Cochrane review, we ended up with the same final trials for the evidence of grading. This is in line with a Health Technology Assessment report from Egger et al. that suggests that most often, a search for English literature in Pubmed is sufficient”. Source: Hellstrom S et al. Ventilation tube treatment: a systematic review of the literature. Otolaryngology – Head and Neck Surgery. 2011;145(3):383-395. Something else I came upon, from the legal field, is the concept of technology assisted review and predictive coding. This technology may help streamline the process of performing high recall retrieval activities which includes systematic reviews. See the following links. I wasn't aware that in the legal system, optimal retrieval of documents in court cases also has the issue of maximizing both recall and precision which I suppose when you think of it, makes quite a lot of sense. What do punk and anarchism have to do with the ebm cochrane post? Is it just a catchy title? > The problem is, as I wrote to you before, that you CANNOT predict this agreement in advance. Broken link, immediately before References, “Are you a luddite?